Watermelon Salsa: sweet with a bite. Refreshing summer appetizer. 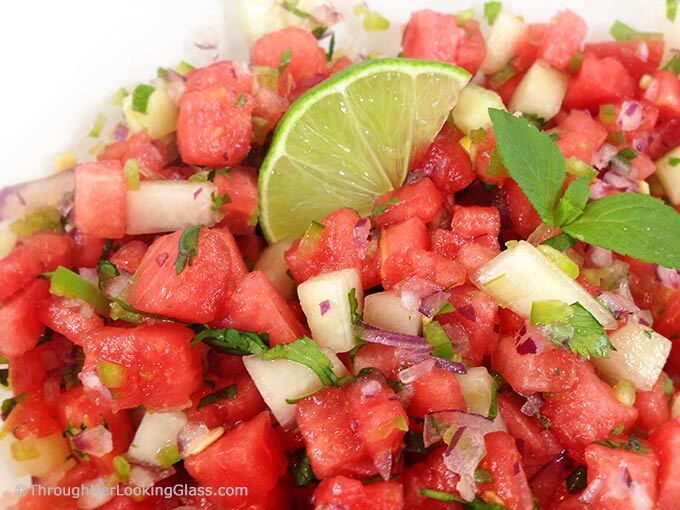 Juicy watermelon, jalapeño pepper, sweet red onion, cilantro and mint combine with tart fresh-squeezed lime juice and honeydew melon. 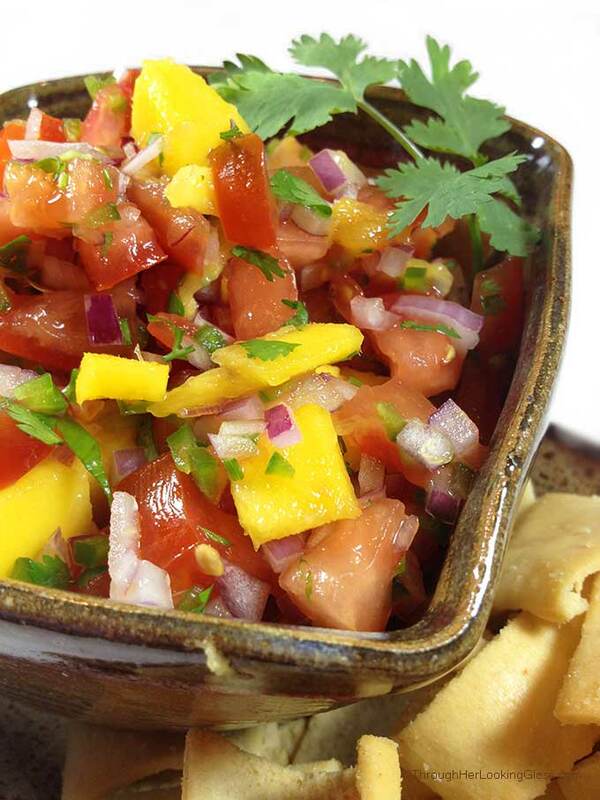 The perfect summer salsa twist! I sure do love watermelon in summertime! Watermelon sherbet, watermelon ice cream, watermelon slushies and watermelon sorbet. And how about an ice cold watermelon triangle? Sweet, juicy and refreshing. A friend of mine worked in the fields in North Carolina growing up. Today he’s a grandfather, but he hoed the rows as a teenager. Picked the beans, corn and peas. Loved working with his hands, and it was really hard work. Most days it was sweltering hot out in the fields. But he smiles talking about the breaks. The mid-afternoon rush to the watermelon patch with the crew. Smashing open a big, juicy one. Diving into the sweet, face first! They say if you’re looking for the perfect, ripe watermelon, pick one that feels heavy for its size. It should have a creamy yellow spot on its underside where it ripened in the sun. And you probably know a watermelon is 92% water. Some people know how to thump a watermelon to tell if it’s good one. I think it must be an art. Kind souls have spied my bewildered face at the bin trying to pick the perfect one. They’ve even volunteered to help. 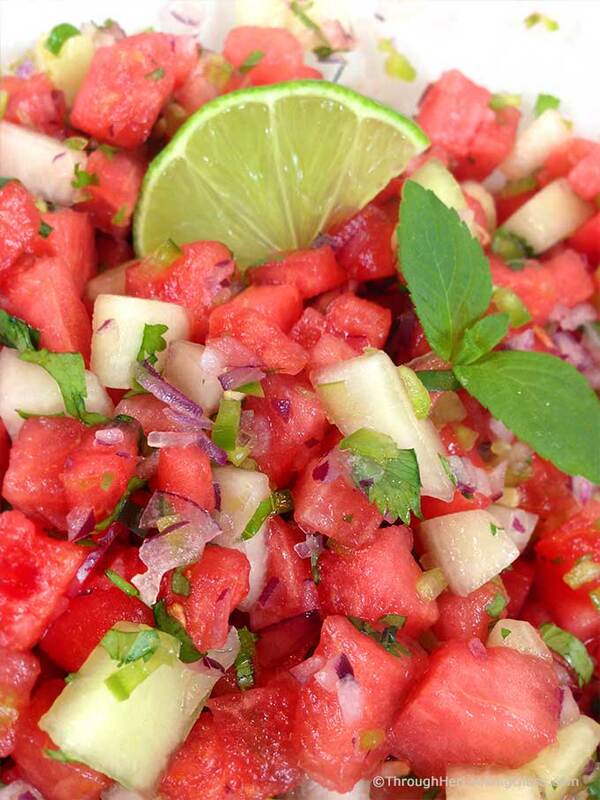 This Watermelon Salsa is quick and easy to make. Dice ripe watermelon, honeydew melon and sweet red onion. Chop fresh cilantro and mint. Mince jalapeño pepper fine. Combine it all with fresh squeezed lime juice and some coarse salt. This is the salsa we’ll be making all summer long at our house. Play with the amounts of cilantro and mint. It’s a great excuse to taste test along the way. (Not that I’d know or anything.) Give all the ingredients a gentle stir in the bowl and serve immediately with pita chips. 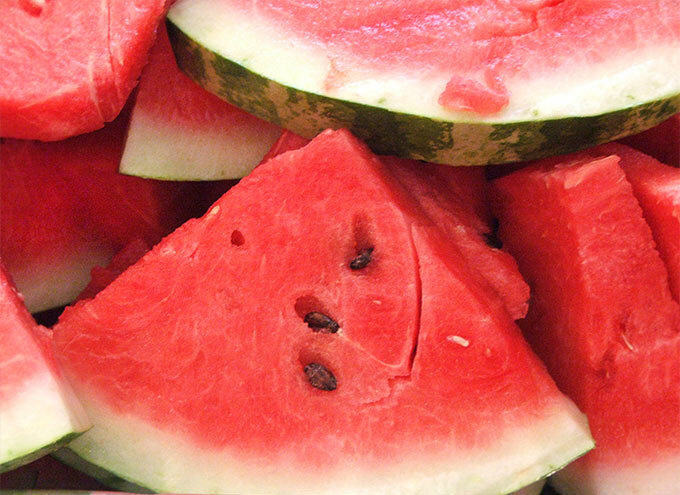 You’ll find that lime juice and salt draw the juice out of the watermelon over time. Just drain some if needed. This salsa is incredibly sweet and delicious, and the watermelon contrasts perfectly with the spicy jalapeño peppers. So fresh. Hope you love it too! Combine all ingredients in a medium sized bowl and serve with pita chips. Best served immediately or within a few hours. The salt and lime juice draw out the watermelon juice as this salsa sits. Just drain off extra juice as needed. This looks so refreshing and light! Love the colors too! My mouth is watering already! I can't wait to make this. Oh thank you Aunt Pinkie! Maybe you could try basil in place of the cilantro? I bet that would be good. Or maybe even some fresh parsley and extra mint. 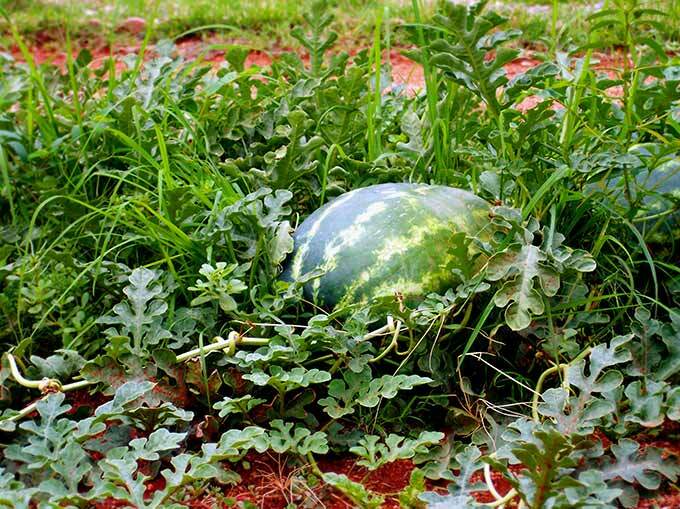 I looooove watermelons but I am not good in picking them, it is really up to chance every time. A few weeks ago I bought one that was inedible and made jam out of it. Also good, but I'd rather have a fresh, sweet, juicy watermelon instead. This salad looks wonderful, I can just imagine the taste. 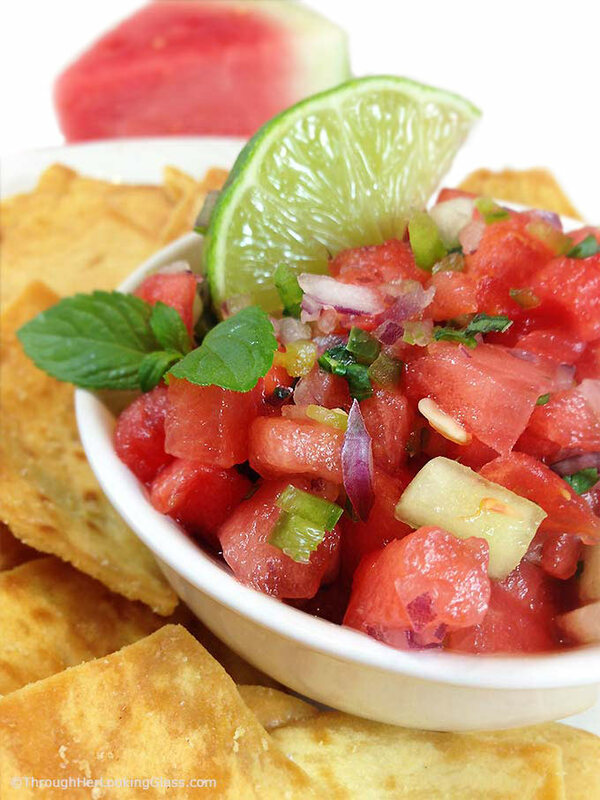 We love watermelon salsa! Can't wait to try your variation! The thumping never works for me either. I don't know what I'm hearing. I think I'll try the "Heavy for it's size" test. That I should be able to do. I love fruit salsas. They are so fresh and light tasting. 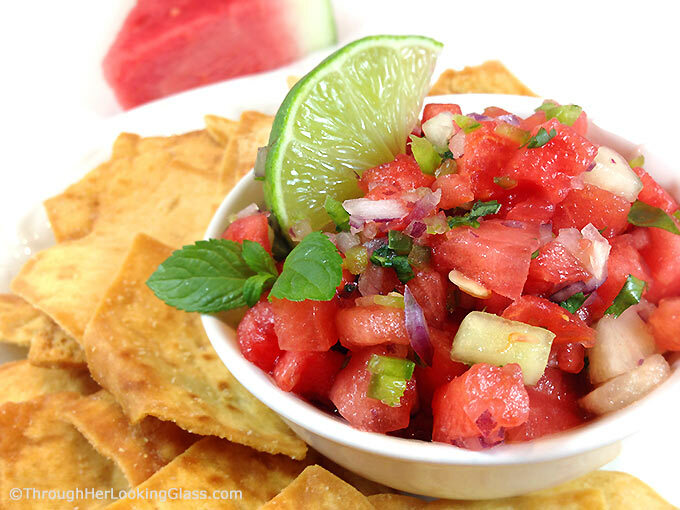 Watermelon salsa sounds like a winner! I absolutely love fruit salsas! This looks so good! This sounds so refreshing and light! I'll bet this would be delicious on fish tacos!